Gardeners in our area are having to deal with unusual amounts of water in their gardens. The amount of water in the soil is more like what we would see in early spring after the snow melt rather than late June or early July. Driving around I see standing water all over our area with no place to go. Soils in many places are waterlogged which means big trouble for plants. 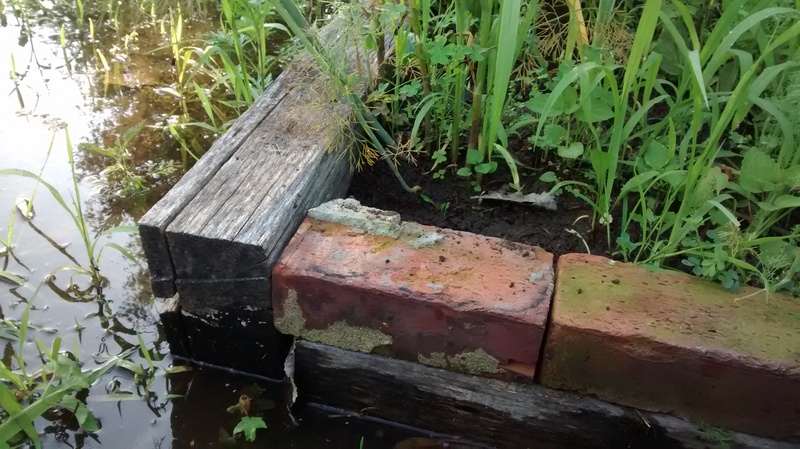 Most plants are able to cope with a day or two of flooding but after that, complications start to set in. The biggest problem is a lack of oxygen in the soil. Plant roots need oxygen to function. All types of soil contain air spaces between soil particles. Fine textured soils with a lot of clay, have very small air spaces while sandy soils have large air spaces. This is very important because plant roots need access to soil air, they can’t efficiently use the oxygen dissolved in water. When we have too much rain, these air spaces fill with water. Once that happens, the plant roots begin to drown and eventually die. A water damaged plant, curiously enough, shows symptoms exactly like a plant that has been growing in a drought. In the case of a drought, there is not enough water for the roots to absorb so the upper part of the plant wilts. With a waterlogged plant, the upper part of the plant also wilts because can’t the roots have stopped working so no water gets moved into the upper parts of the plant. My raised bed has helped keep the plants up out of the water. I haven’t even been able to weed this bed because of the high water. After a the soil returns to normal, plants need to be watered more often because they have fewer roots. Often, if the damage is not too bad, the plant will recover by growing more roots to replace the ones lost by drowning. If it the damage is too great, the plant will be stunted and never be able to live up to its potential. Another problem, especially with a vegetable garden, is the potential for contamination. In urban or suburban neighborhoods where all sorts of properties are nearby, there is the potential for flood waters to carry contaminants like bacteria or chemicals. Think of that dog kennel down the street or that parking lot with runoff water carrying motor oil and other debris. You may want to think twice about eating vegetables exposed to contaminated flood water. There’s some new unexpected members to our garden family of plants this year. It is a group of moth mullein plants. I’m not really sure how they got there. I figure they most likely hitched a ride as seed in soil from some other plants that I transplanted from someone else’s garden a couple of years ago. 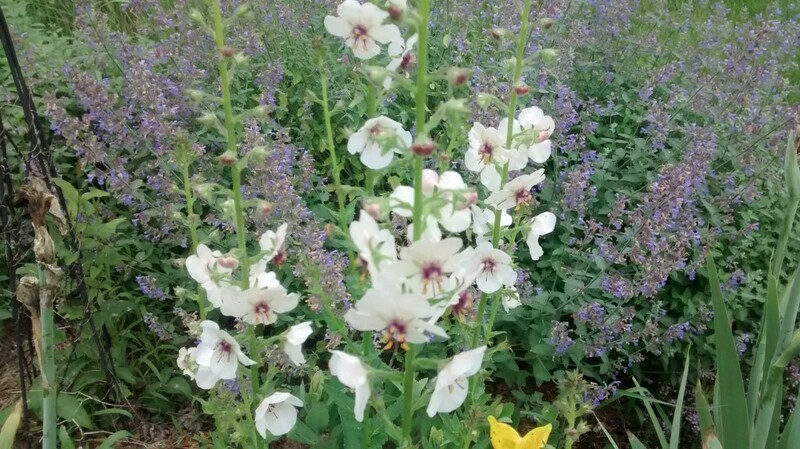 Since moth mullein is a biennial, it takes two years to bloom. The first year for all biennials is a nondescript growing stage which is why I hadn’t noticed the mulein until now. If I was a more tidy gardener, I probably would have pulled them out last year thinking they were some kind of weed seedlings. Moth mullein is a non-native species so, many people consider them actual weeds. Originally they were brought to this continent as a decorative flower and useful herb — it has some insecticidal properties. While it may be an immigrant to this country, moth mullein seem to have very little impact on the native ecosystems of our area. They really can’t compete with well-established native plants. However, each plant produces thousands of seeds a year and tilling the soil tends to stimulate their germination. In the garden they may eventually wear out their welcome. In some states they are classified as noxious weeds but not here. American goldfinches feed on the tiny moth mullein seeds. I saw a pair of goldfinches checking out my plants today. The seeds are not ready yet, so they decided to leave before I could get a photo of them. The seeds are pretty small, about one millimeter long, and can sprout even after laying for a hundred years. I’m not too worried about the mullein taking over my garden just yet. They are behaving themselves in a very dry flower bed and are only a couple of feet tall. In your garden, if it has fertile soil and is well watered, they might grow twice that size. Moth mullein is a perfect candidate for an English cottage garden where plants are expected to reseed themselves year after year. Seeds are available through mail order seed catalogs and online sellers. Of course you can always collect some from the wild since they are not endangered nor invasive in Michigan. Whenever I taste fresh dill in a dip or salad, it brings up memories of my childhood spending time with my Polish grandmother. During the growing season I remember her using dill for a lot of different things. As a result, the lingering scent of fresh dill hung in her kitchen all summer long. For that reason alone dill is one of my favorite herbs. Another good reason to put it at the top of the list, besides the nostalgia factor, is how easy it is to grow. In my garden, I have it coming up year after year on its own. It all started several years ago when I had a bunch of dried dill umbels (tops) hanging up in the open air in a forgotten part of a shed. When I found them they had collected a lot dust and I was in no mood to try to clean them. How would you do that anyway? So, I crunched them up with my hands and threw the seed into every corner and edge of the garden. Ever since then, I’ve never had to worry about planting dill. They show up every where. I just have to make sure I leave a few plants to mature and drop seeds. 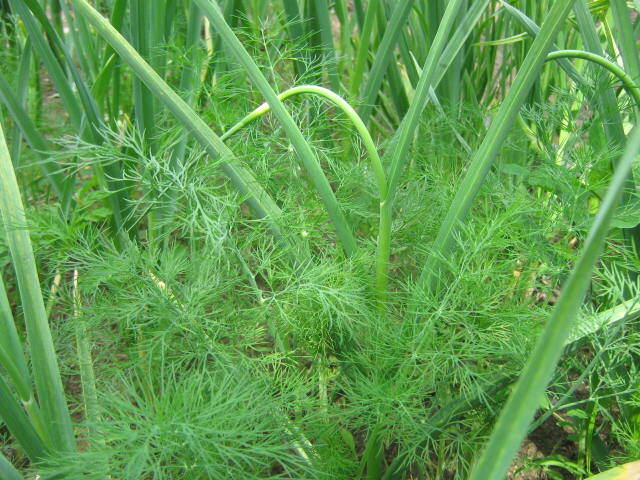 The normal way to start dill is to sow them in rows at the spacing of about 15 to 20 seeds per foot. It takes about a week to ten days for the seeds to emerge. Once they are up, thin them to about three plants per foot. You will have to keep the weeds down around it, just like the rest of your garden. I have dill growing in the garlic bed. Once the garlic is gone, I’ll let the dill finish growing. Keep in mind that dill typically grows to a height of three or four feet so it will shade shorter plants. That’s why I try to restrict my dill to the out of the way places in my garden. Dill leaves — also called dill weed — can be cut and used anytime during the growing season. For dill pickles, harvest the umbels when the seeds are full size but haven’t turned brown. That’s the secrete for super flavorful dill pickles. If you can’t use all of your dill right away, air-dry the umbels in the shade. Traditionally, the dried umbels are stored in glass jars but I suppose any air tight container will work. Besides, a glass jar of dill umbels sitting on your kitchen counter is very decorative and lets everyone know you are a real chef. There is still time to sow dill seed. Once you have your first crop of dill and remember to leave a few plants in the garden at the end of the season, you won’t have to plant it ever again. Iris are one of my favorite flowering plants for a number of reasons but mainly it’s because they are so easy to grow compared to some other plants. I’m not the only that knows this which is probably why you see so many irises in gardens. 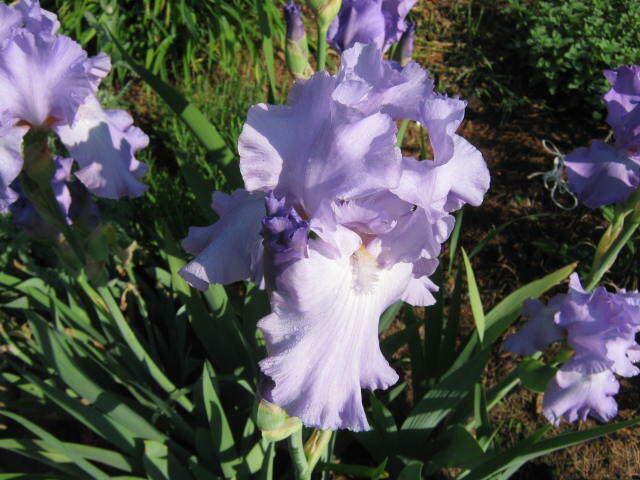 Although there are several types of irises, the one that everyone thinks of when you say “iris” is the bearded iris sometimes called German iris. Irises put on quite a show in return for so little effort on our part. Irises are perennials, which means plant them once and they’ll come back again year after year. They are very resilient plants and are quite cold tolerant. Ours when un-mulched came through two extremely cold winters and never missed a step. 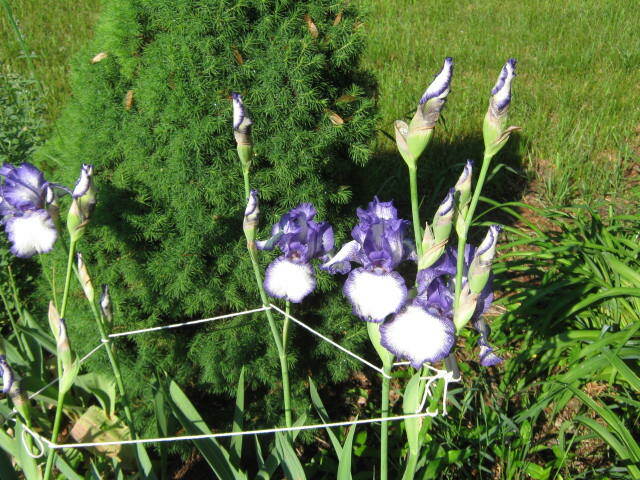 Bearded irises require well-drained, sunny locations to thrive. Soggy soil, especially during the summer, will cause their roots to rot. On the other hand, they need plenty of water during the early spring, shortly after they wake up from their winter dormancy. Around here, we usually get enough rain in the spring for them to be satisfied. Sometimes high winds and heavy rain will knock over iris stalks. Tying them to stakes will help them stay upright. The most common mistake beginners make when planting iris is to place them too deep into the ground. Only the bottom two-thirds of the root rhizome gets covered with soil. The other on-third is above ground as I heard someone say, “like an alligator”. German irises grow so prolifically that they will over-crowd themselves over time. So, every three or four years they need to be dug up, divided and replanted. It’s a relatively easy thing to do and you don’t have to worry much about hurting the plant. I’ll discuss this in a post later on this summer as we get near thinning time. 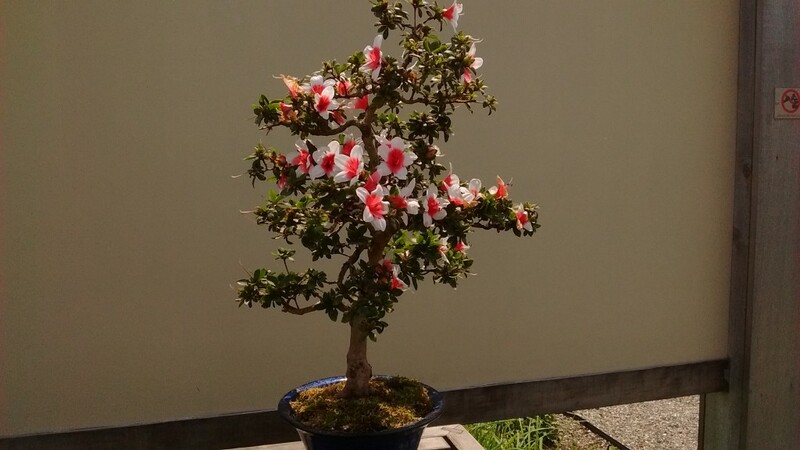 I think just about everyone enjoys looking at bonsai, the Japanese art of growing miniature trees in containers. 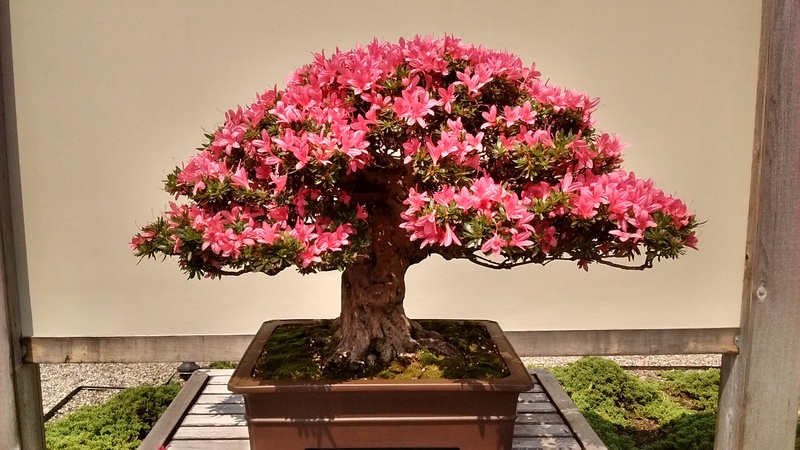 Even those who are not particularly interested in plants will stop and take a second look at bonsai. The azaleas on display are the species Rhododendron indicum. A fantastical shaped bonsai at Matthaei Botanical Gardens. The show is free and runs from June 6 through June 14, 10 am – 8 pm daily. It’s an easy drive to the Gardens from anywhere in southeastern Michigan and northwestern Ohio. They’re located at 1800 N. Dixboro Road, Ann Arbor. 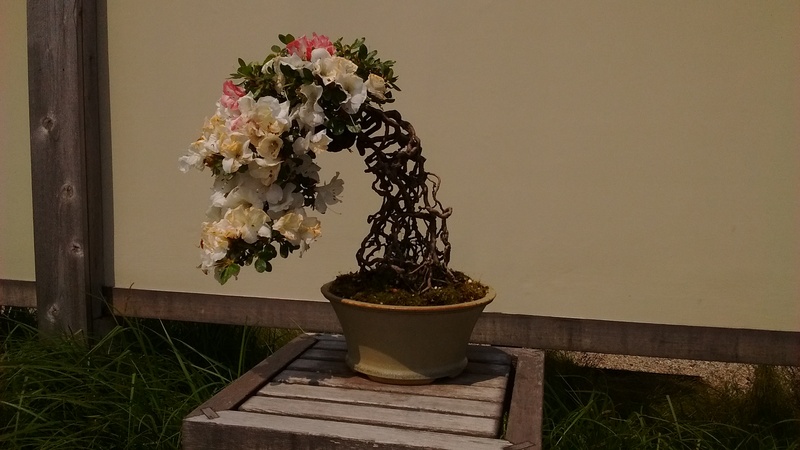 It might not be a bad idea to call ahead and make sure the bonsai are still blooming. The phone number at Matthaei Botsanical Gardens is 734-647-7600.